1) Notice how often you interrupt, explain, defend your position, lecture, or give a command when your child tries to talk to you. 4) When your child is finished, ask if she is willing to hear you. 5) After sharing, focus on a solution that works for both. I REALLY need this tool card! I'll bet my son said "Dad, you're not listening" 10 times during the past week. And you know what...he's right. I tend to make the mistake of telling my children what happened, why it happened, and what they should do about. Half the time I don't even listen long enough to get the whole story. This is very frustrating for my son because he doesn't always want me to solve the problem for him. He just wants to share with me and he is hoping I will have a little empathy for his situation. We had a situation this past week when our dog got a little aggressive with one of Gibson's friends. I wasn't home and the dog was startled when his friend walked in and nipped at him and also got Gibson a little bit when he intervened. When I found out about this, I immediately started accusing Gibson and scolding him before I even heard the whole story. Gibson responed "Dad, you never listen! And you don't believe me anyway!" Later I found out that Gibson had gone on the internet and learned all he could about how to train your dog not to bite. He had a plan and wanted to share it with me, but I never gave him the chance. For this coming week I am going to make an effort to focus on listening to my children. I won't interrupt or try to fix the situation until they ask me for help. I will simply listen, ask questions and show empathy. After they are finished, I will use Step 4 to see if they are willing to listen to my ideas. And then we can focus on a solution together. I really need this tool card too! I find that I'm in such a "solve everything" mode all the time, that I'm not giving my kids the opportunity to solve things themselves (or with help) and feel good about doing just that. I love the idea of focusing on one thing for the week. Oooh. this is such a good one. I have realized after my kids have tried to share something and I've blown it by interrupting. I feel horrible later at loosing the opportunity to understand something from their point of view. It is a real regret. I've tried to recover and start conversations up again -you just can't get it back with the same genuineness and freshness. 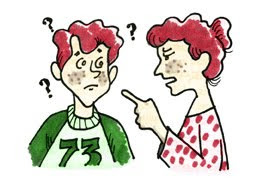 I've also noticed that when I have interrupted , especially with my teens, it has been to foist some gem of wisdom at them and when they weren't receptive, it was a waste of time and hot air. Oh well, live and learn! We introduced this card at our family meeting last night and my daughter said "Yeah Mom, it's like today when I was trying to show you something and you said you were busy". When I pointed out that I was right in the middle of doing something when she asked, my husband replied "Hey, wait, are you defending yourself?". Then I tried to explain, digging myself deeper into the "not listening" hole! We all broke out laughing and the mood at the meeting was one of the best yet! This is a really good one to practice. I am a big fan of Hindu mythology, and one of the crazier looking gods is Ganesh - he has an elephant head and a human body. The author Promod Batra describes the reason for this as such "Lord Ganeshjee's BIG HEAD inspires us to think big and think profitably; the BIG EARS prompt us to listen patiently to new ideas and suggestions; the NARROW EYES point to deep concentration needed to finish tasks in hand well and quickly; the LONG NOSE tells us to poke around inquisitively to learn more, and the SMALL MOUTH reminds us to speak less and listen more"
This tool card has been a GREAT help this week. Lately when I pick my 8 year old up from school, he is really disappointed if one of his friends can't come over and he complains and gets angry which leads to him being upset all the way home. It snowballs so that EVERYTHING that he's done that day seems to have been awful. Most days I try to ask what good things happened and talk about setting up get-togethers for another day etc. This week I LISTENED, showed empathy and mostly gave him space to have his feelings. After that, the ranting didn't last as long and he apologized for making the walk home not very much fun. This is a hard one to do- but so important. So many times I have found that I jumped to conclusions about children and what they are trying to say or what I perceived just happened instead of listening to them and giving them credit for knowing what they are talking about! I am a first grade teacher- and with a classroom of 20 kids and a plate full of curriculum and high expectations- sometimes it can be hard to find (make) the time to stop and listen= but it is so important!! Thanks for doing this and keeping us all "listening!" 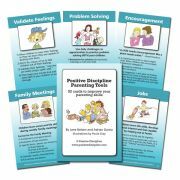 This tool is so valuable yet so hard for us parents to use. I find that I have to concentrate so hard to really listen--as opposed to look interested and nod my head. I pay attention to my body and their body and their actual words--have to be very mindful. Otherwise I get so distracted!